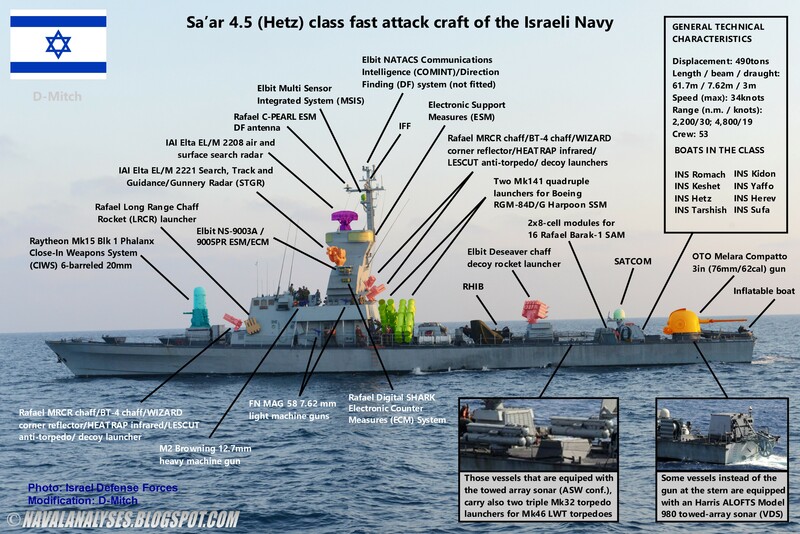 Sa'ar 4.5 class is an evolution of the Sa'ar 4 class fast attack missile boat of which 10 built. 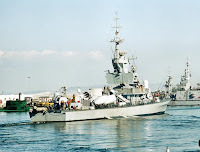 The first three boats in the new class were INS Romach (launched and commissioned in 1981), INS Keshet (launched and commissioned in 1982) and INS Nirit (keel laid in 1984 but the construction ceased due to lack of funds and it was finally launched in 1990 and commissioned in 1991) that was renamed to INS Hetz. 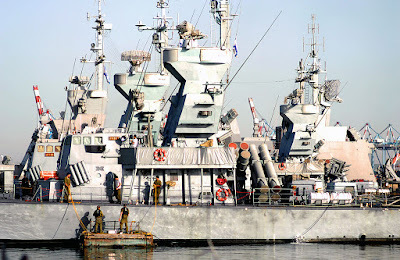 INS Kidon, INS Tarshish, and INS Yaffo commissioned in 1997, 1997, and 1998 respectively. 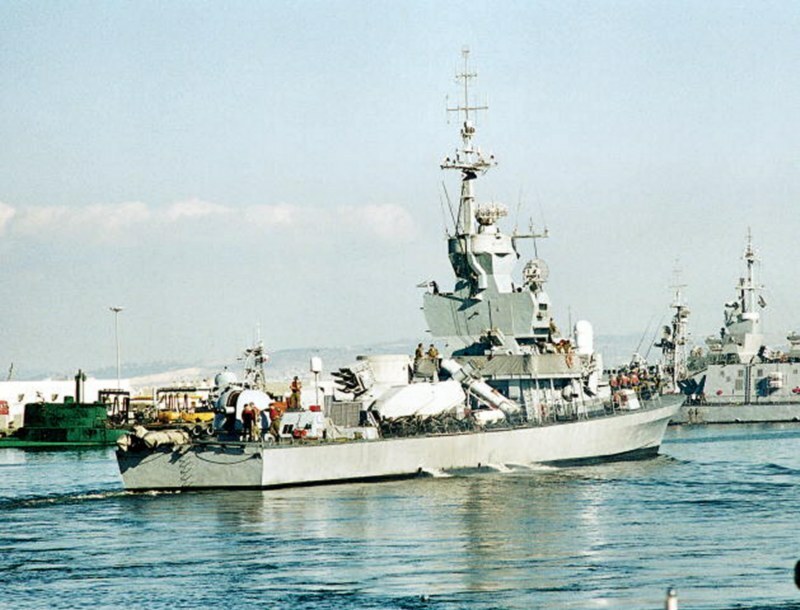 These three boats were built comprising various older systems that were disassembled from Sa'ar 4 class missile boats with the same names, atop brand new Sa'ar 4.5-class hulls, thus they are somehow converted Sa'ar 4 class boats. 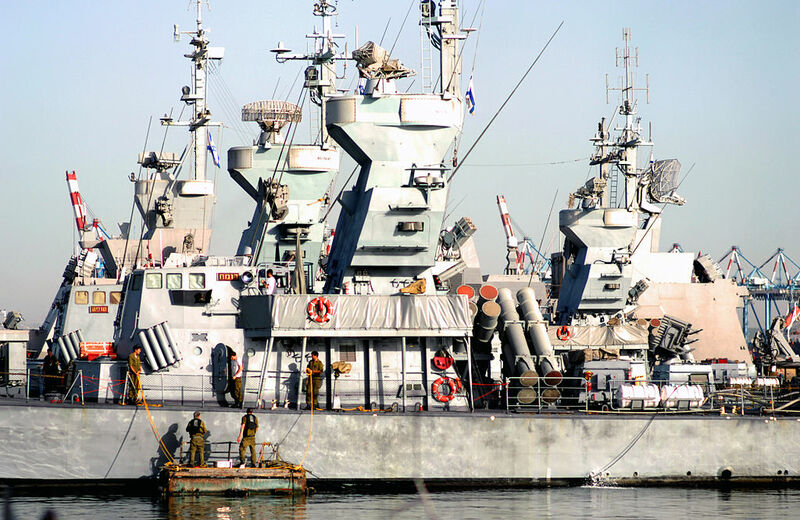 Another two boats called INS Herev and INS Sufa were commissioned in 2002 and 2003, raising the number of Sa'ar 4.5 Hetz subclass missile boats to total eight. 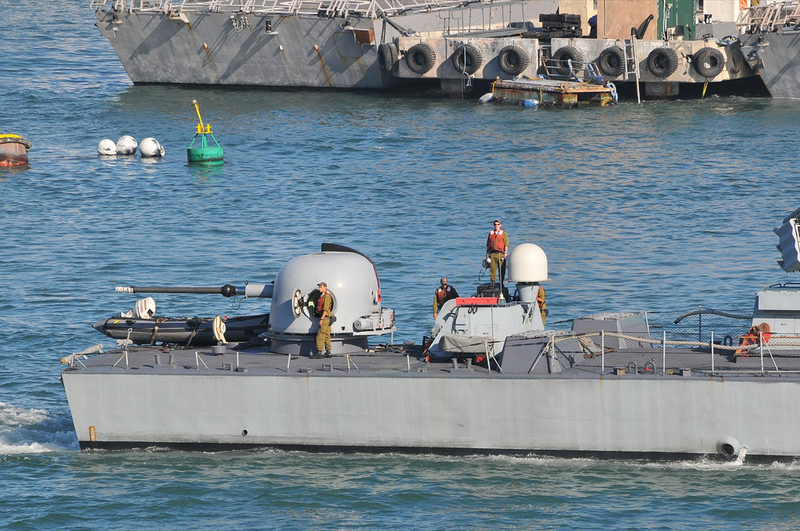 As of 2017, all Hetz subclass boats are in service with the Israeli Navy. 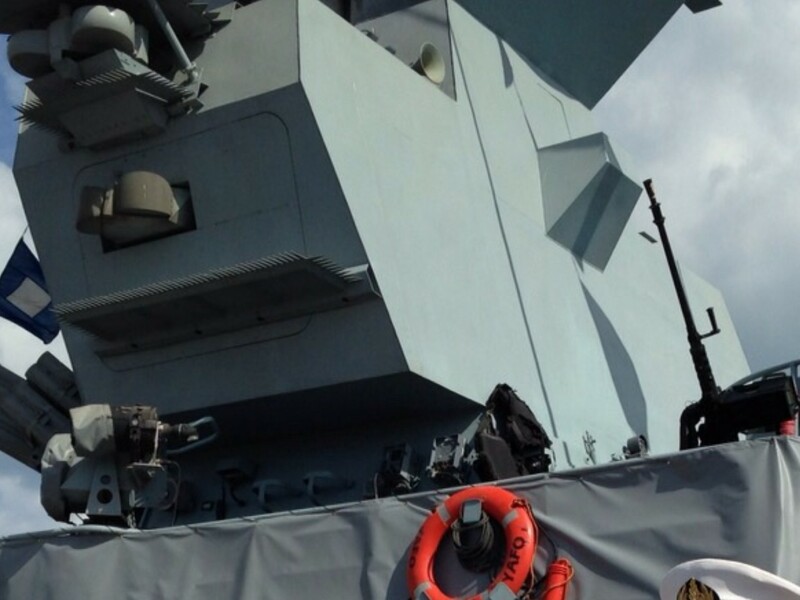 None of the boat has pennant number in order to confuse the potential enemy. The class together with the three Sa'ar 5 class corvettes are today the main surface combatants of Israel. The general characteristics of the class is a displacement of approximately 500tons at full load, length of less than 62 meters, beam of 7.6m, maximum speed of 34 knots and a range of 4,800n.m. with the speed of 19 knots. According to Janes Fighting Ships (2014-15) only Hetz, Keshet and Romat, the "new-built" Sa'ar 4.5s have a length of 61.7 m. while the rest are 58m long. That's a detail though which I cannot verify (thanks Perman for his comment on that!). The crew is about 50.The power propulsion is from four MTU 16V 396 TB91 diesel engines outputting 16,000 horsepower (4,000 each engine) to four shafts. 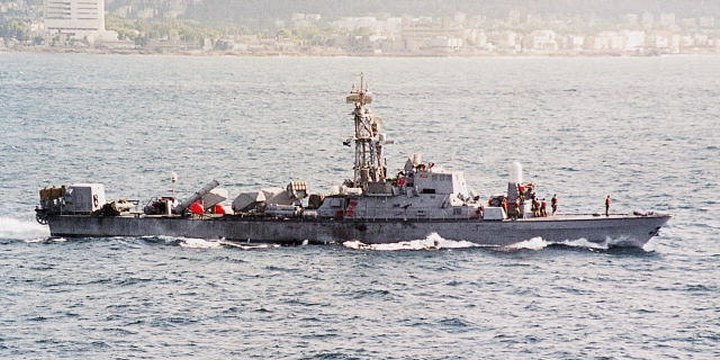 Modified photo of a Sa'ar 4.5 class fast attack missile craft of the Israeli Navy. High resolution image here. 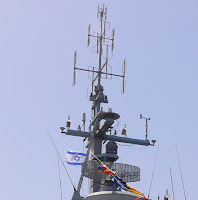 Stern gun, SATCOM and Barak 1 VLS. 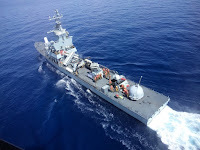 The ships are equipped with a slightly modified OTO Melara Compatto (Compact) 3in (76.2mm) fully automatic gun installed in a gun turret of which the shield is made of fiberglass. 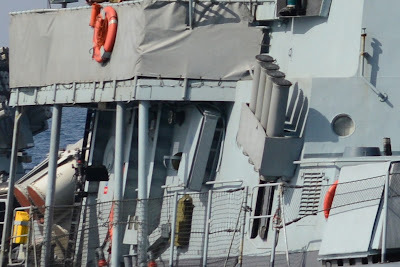 The gun turret is located at the stern instead forward of the bridge which is the usual position for almost every warship, especially FACM. 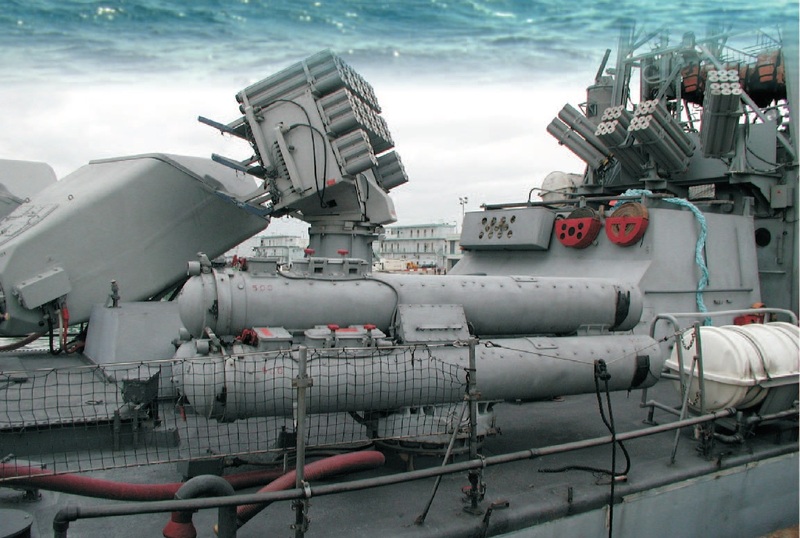 The gun has excellent performance in any kind of role, such as air-defence, anti-surface, anti-missile and shore bombardment role. 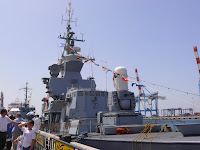 It can hit air and surface targets at a distance of 12 km and 16 km respectively with a rate of fire 85 (100 rounds per minute with a retrofit kit; it may be presumed that Israeli Navy has installed this kit on its guns and has carried out other improvements) and weight of shell greater than 6 kg. There are 80 ready rounds on the mount. Watch here a video of live fire exercises. 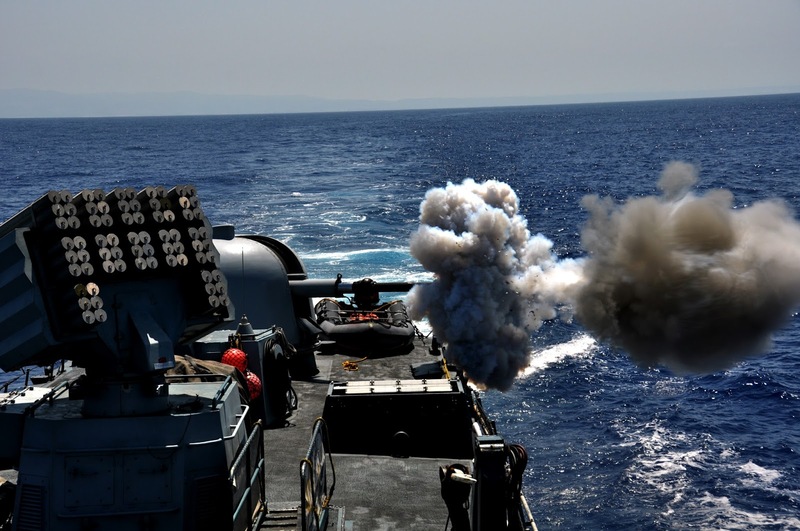 In August 2016, the Israeli Navy was in contract negotiations with the US Navy to purchase 76mm rapid-fire guns from Leonardo-Finmeccanica. 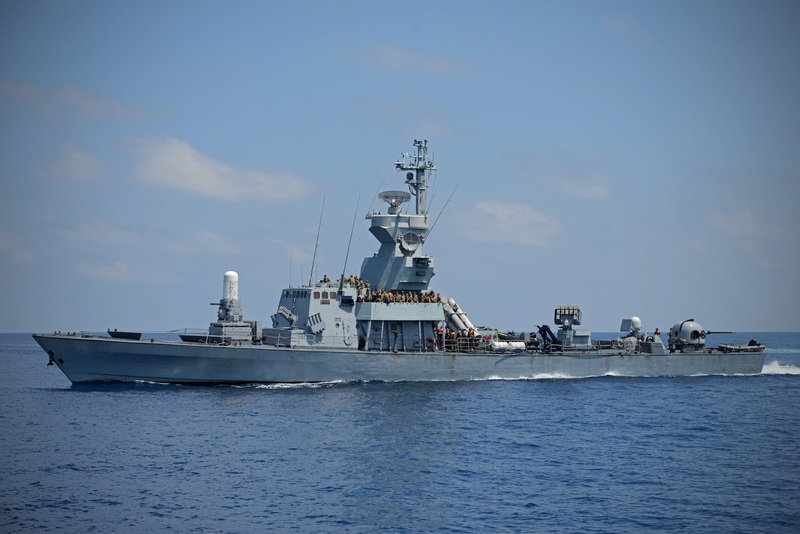 Israeli Navy officers said the new guns would equip Israel’s surface fleet of Sa’ar-4.5 vessels, US-built Sa’ar-5 corvettes and the four new Sa’ar-6 corvettes which are under construction at the German shipyard ThyssenKrupp Marine Systems and of which the first is expected to enter service in 2019. 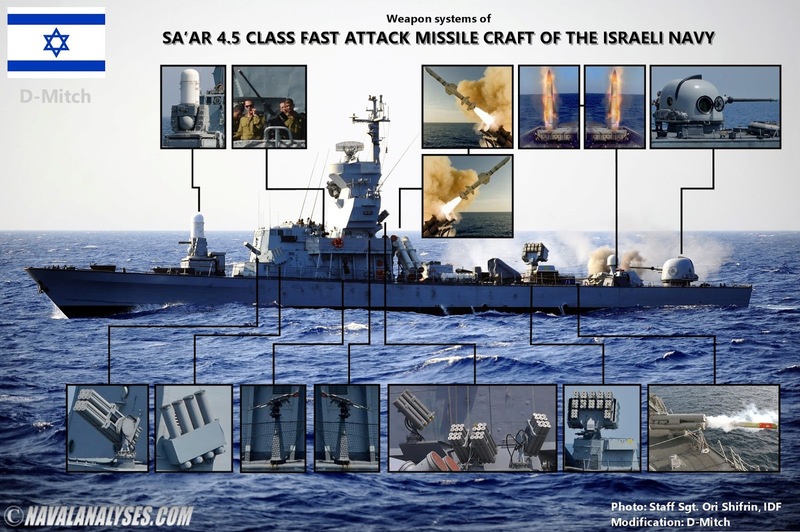 Hard-kill and soft-kill weapon systems of a Sa'ar 4.5 class fast attack missile craft. High resolution image here. 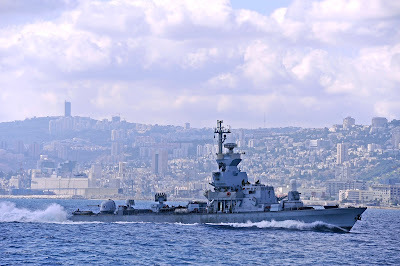 Except the main naval gun, the ships are equipped with a combination of pintle mounted heavy machine guns (M2HB) and light machine guns (FN MAG 58 or IMI Negev of 7.62mm). The M2 has a maximum (effective) range of around 1,830m and a cyclical rate of fire of approximately 600 rounds per minute. The rate of fire is 1,000-1,300 rounds per minute and the effective firing range is close to 1km. The IMI Negev and FN MAG 58 light machine guns share similar technical characteristics. Both have a maximum (effective) range of around 1,000m and a cyclical rate of fire between 800-1,000 rounds per minute. Watch here a video of live fire exercises. 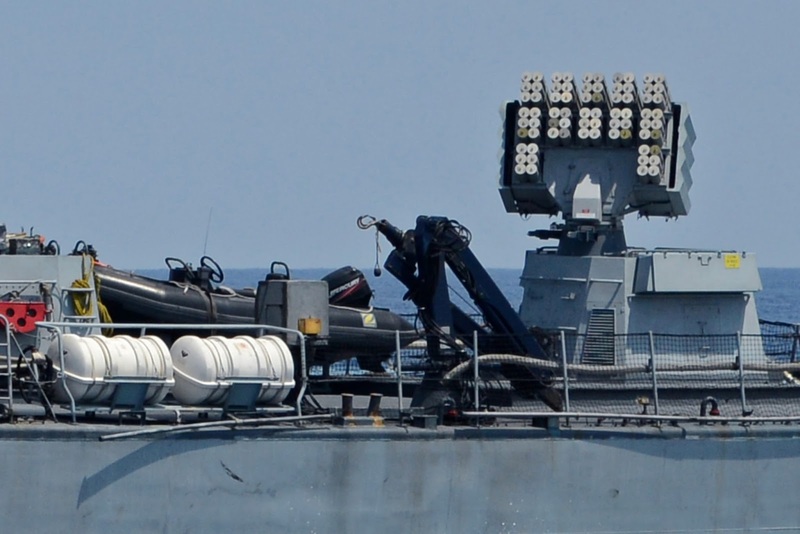 Finally, there are no Oerlikon 20mm guns as it is reported on many sources. 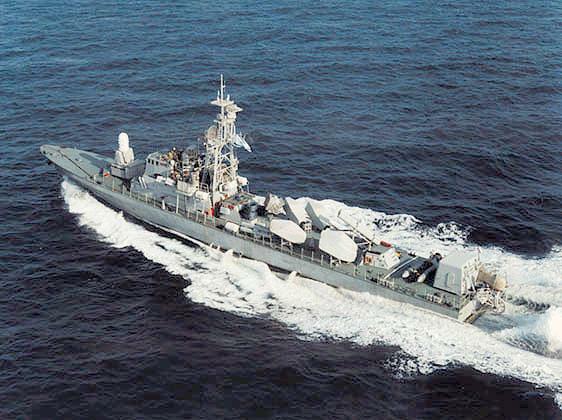 Each boat carries eight (8) Boeing RGM-84D/G Harpoon anti-ship missiles in two Mk141 quad launchers amidships. These missiles have a range greater than 120km, a sub-sonic of speed of 860km/h (Mach 0.9) while they carry a warhead of 221kg. Harpoon missile has a low-level, sea-skimming cruise trajectory, active radar guidance and it is capable to perform pop-up manoeuver which it is a rapid climb of the missile to about 1,800m before diving on the locked target. 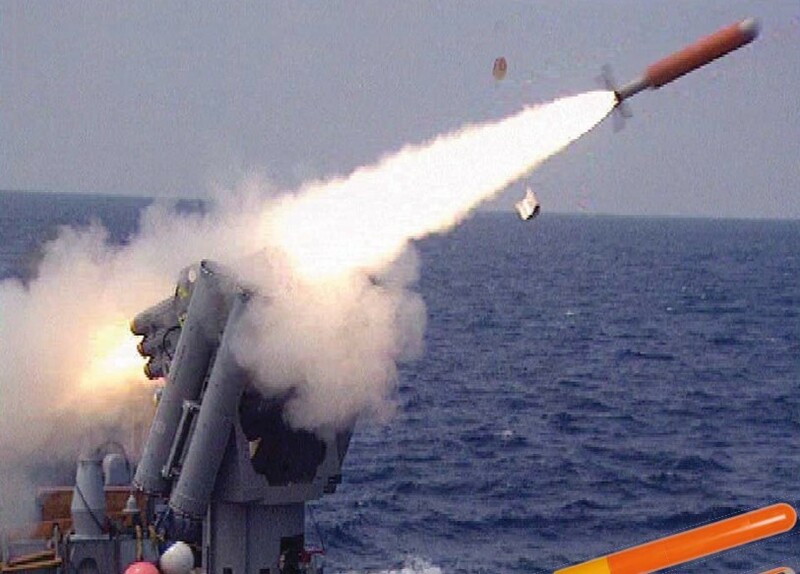 Therefore due to this sea-skimming capability, the missile makes it difficult to detect and allowing it to hit the target just above the waterline causing a significant hit. 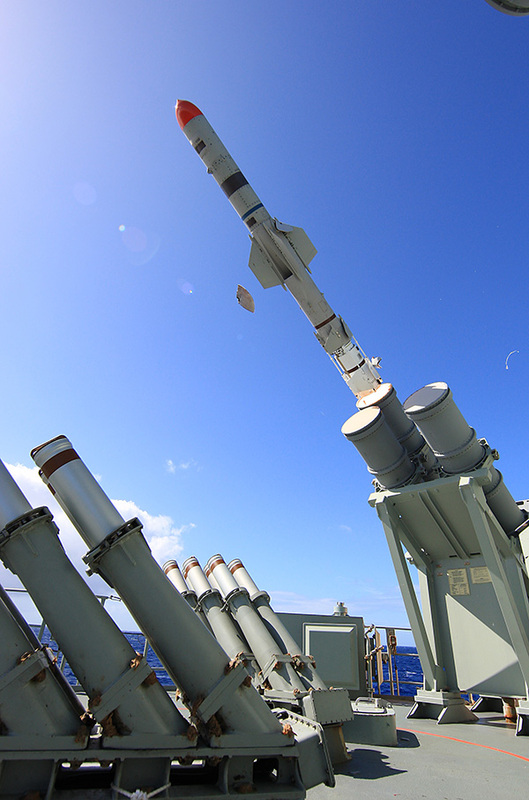 Watch a recent Harpoon launch video from a Sa'ar 4.5 FACM here. Years ago, the boats in the class were carrying also six single launchers amidships for Israel Aerospace Industries (IAI) Gabriel II short-to-medium range anti-ship missiles. With six Gabriel and eight Harpoon anti-ship missiles, 16-32 SAM, gun and CIWS, the boats were definitely the most powerful in the category worldwide. The sea-skimming subsonic Gabriel MkII was developed in the late '70s and has a semi-active radar and a maximum operational range of up to 36km carrying a 100kg warhead. 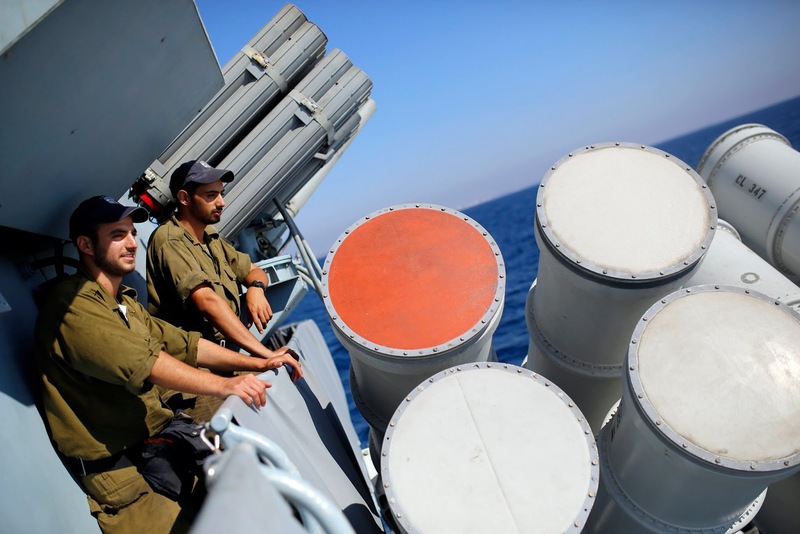 The launchers were removed after this type of the missile retired from the Israeli inventory. 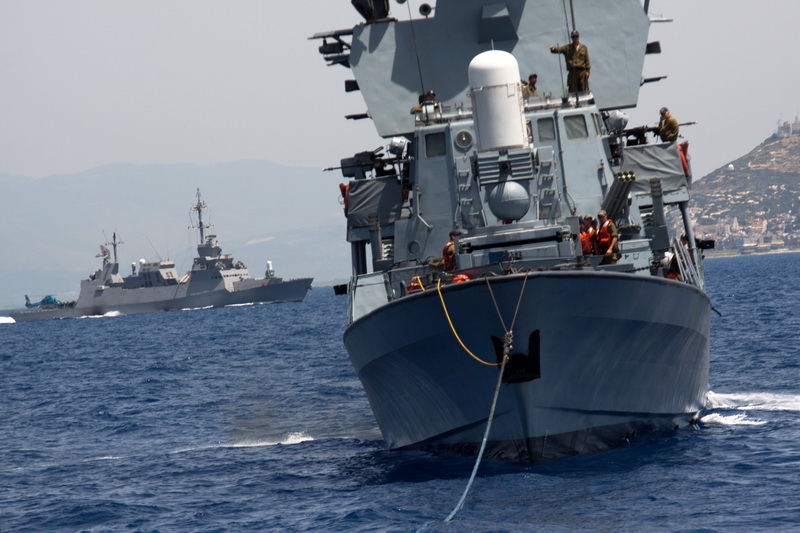 Israeli Navy has modernized the Harpoon missiles through a programme called HEP (Harpoon Enhancement Program). The exact details of the programme are confidential. 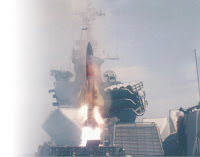 IAI has developed the Advanced Naval Attack Missile or else Gabriel Mk V, a missile with dimensions similar to the latest blocks of Exocet and Harpoon missiles, offers superior performance compared to most contemporary missiles, particularly when employed in littoral waters and sophisticated soft- and hard-kill defenses. It may be presumed that the missile will replace in the future the Harpoons aboard Sa'ar 5 class corvettes or some or on some of Sa'ar 4.5s as Israel has not upgraded its Harpoon missiles into the latest Block II configurations (RGM-84L) despite the local upgrades. Cutaway of a Sa'ar 4.5 FACM in full armament configuration that includes six additional Gabriel and 16 Barak SAM. 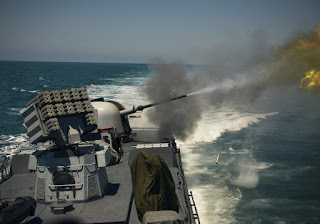 At the bow of the vessels and forward of the bridge, a Raytheon Mk15 Phalanx Close-In-Weapon System (CIWS) is installed, a very popular system worldwide in this role. Phalanx is a rapid-fire, computer-controlled, radar-guided gun system designed to defeat anti-ship missiles and other close-in air and surface threats. The system combines a K-band digital MTI search radar and a K-band pulse Doppler monopulse track radar with a transmitter. As a self-contained package, Phalanx automatically carries out functions usually performed by multiple systems – including search, detection, threat evaluation, tracking, engagement, and kill assessment. The block that belongs the Phalanx of the boats, is the old Block 1 (upgraded Block 0 systems), and thus the system lacks the stabilized Forward-Looking Infra-Red (FLIR) sensor, the automatic acquisition video tracker and the other improvements which have the newer models such as the Block 1B. The systems in Israeli service are old models as they lack the larger magazine drum of newer Blocks (Baseline 0, 1 etc.) and the gun stabilization structure (barrel brace and muzzle restraint), thus they are equipped with a hydraulic gun drive that achieves a rate of fire to 3,000 rounds per minute. It is not known if the Israelis have improved the search radar sensitivity or have implemented the Block 1A's High Order Language Computer (HOLC) or other improvements in order to better process engagement algorithms, to improve performance against maneuvering targets and thus to increase accuracy. 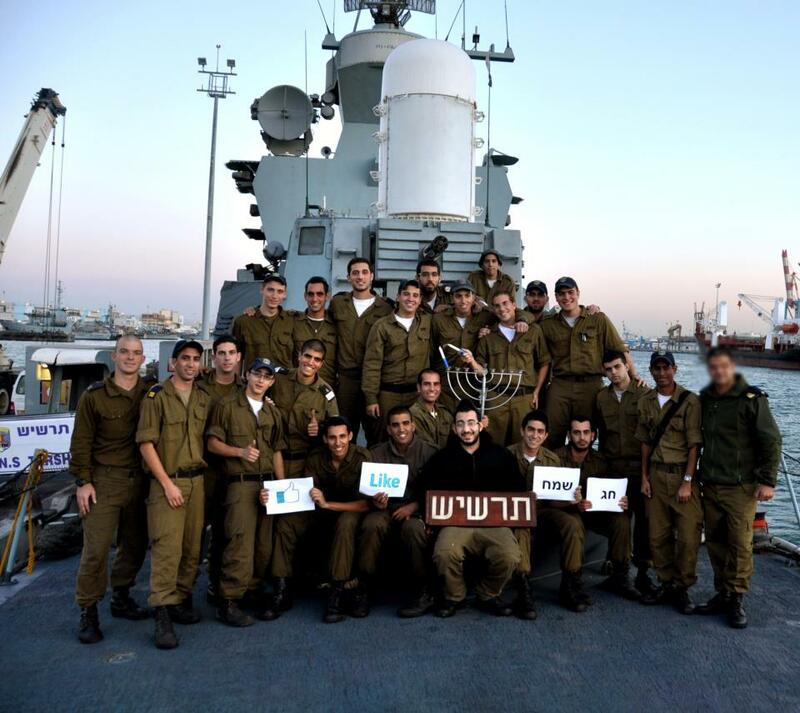 We may assume though, that the Israelis have certainly carried out their own upgrades. Phalanx has an electrically controlled 20 mm (0.79in) M61A1 Vulcan 6-barreled Gatling type rotary autocannon that has an effective range of more than 3.5km and a rate of fire of higher than 3,000 rounds (!) per minute with a magazine drum holding 1,550 rounds. Notice also that the Israeli Phalanx systems are unique in comparison with other navies' systems, by having protection over the Gatling cannon and the magazine drum, perhaps because are located forward and thus the cover protects the sensitive areas from seawater. 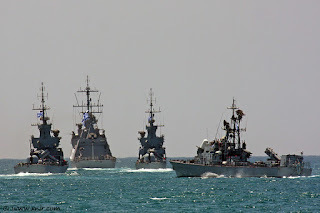 All the boats in the class can carry if needed a special equipment for anti-submarine warfare (ASW) purposes which was obtained from retired Sa'ar 4 vessels which had been converted in order to perform that role. 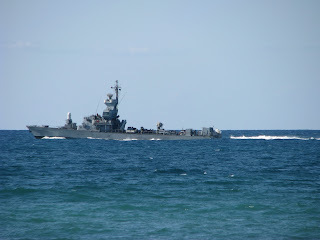 ASW capability is provided by two triple-mount Mk 32 torpedo launchers for Mk46 LWT torpedoes and a Harris (former EDO) Model 980 Active Low-Frequency Towed Sonar (ALOFTS) with its related equipment. 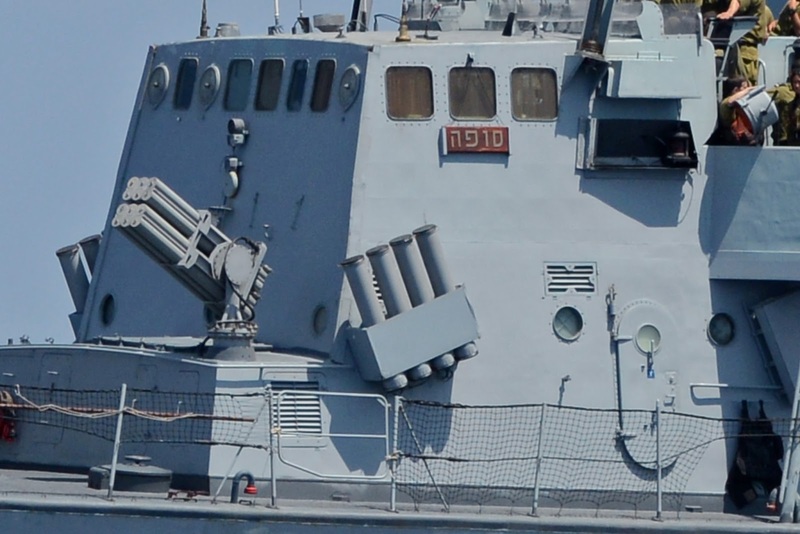 The latter, is installed instead of the OTO Melara gun turret. ALOFTS provides a long-range sensor capability that counters the threat of extremely quiet submarines operating in either shallow or deep water. Automatic detection and tracking are provided for both active and passive operations, greatly reducing operator workload. 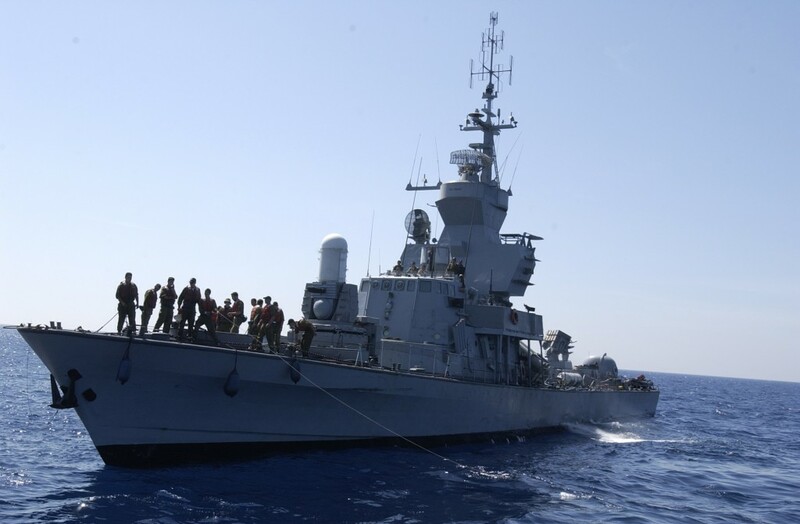 The Israeli Navy has used EDO’s sonar systems in the past (Model 780), and after a thorough review, Israel signed a contract in 2006 valued at more than $7 million, plus options for additional systems. The Mk32 torpedo tubes launch the Honeywell Mk46 Mod 5 active or passive/active acoustic homing lightweight torpedoes. These torpedoes have a range of approximately 8,500-11,000m at 45 knots (maximum speed) and they carry a very powerful warhead of 44.5kg for this category of lightweight torpedoes. They are designed to attack fast submarines and to engage them even over 400m below sea level as well as surface targets (latest variants such as Mod 5). 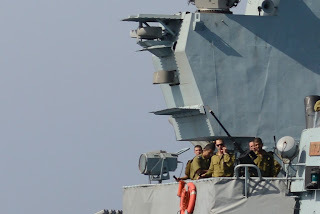 The anti-aircraft protection of the boats is provided by the Barak 1 short-range missile system that was developed by Israeli Air Industries (IAI) and Rafael, and has both anti-air and anti-surface capability. 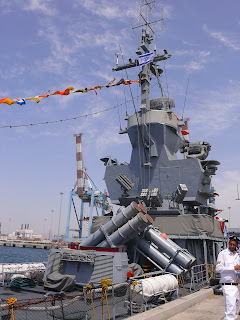 The supersonic (Mach 2) surface-to-air missile (SAM) Barak 1 missile is vertically launched from two 8-cell modules (in total 16 missiles) located at the aft section behind the naval gun. Boats in the class have been spotted in the past, perhaps just for trials, with four such modules therefore those boats could carry up to 32 (!) 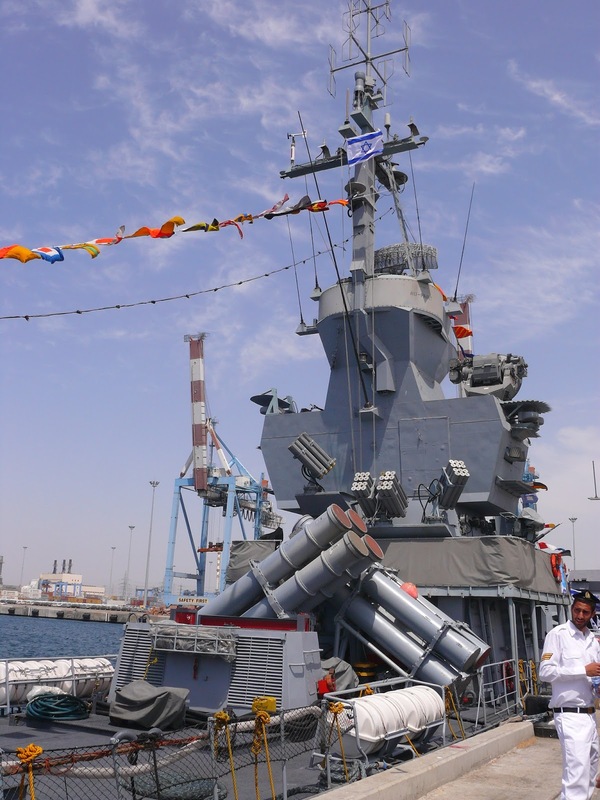 Barak 1 SAM which is not just impressive armament for boats in the category but also for larger warships such as corvettes or frigates such a large amount of SAM on board. The regular load is though two modules. The missile uses radar Command-to-Line-Of-Sight (CLOS) guidance, in which a ship-borne radar (the IAI/ELTA EL/M 2221 STGR of the boats) monitors the intercept and continuously guides the missiles to the target in a maximum range of approximately 11 km. The system carries a 22kg blast fragmentation warhead and achieves a very short response time (360 deg. 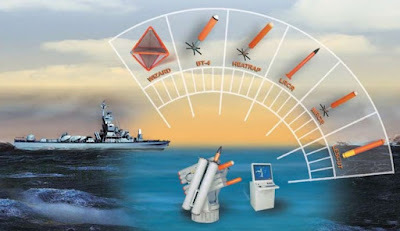 coverage by vertical launch) as well as a short minimum range (hundreds of meters) against any kind of air targets including sea-skimming anti-ship missiles and low radar cross section threats with a high kill probability in a variety of challenging operational scenarios. 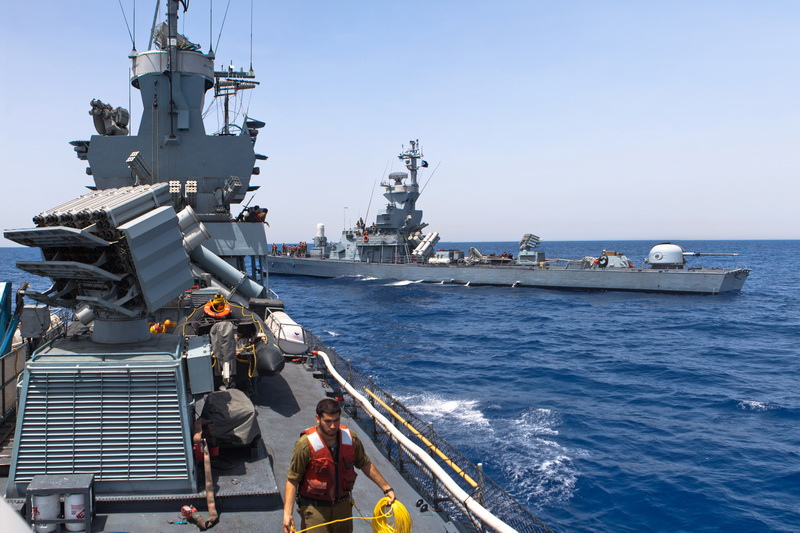 Except Israel, this missile is in service with the navies of Chile, India and Singapore. 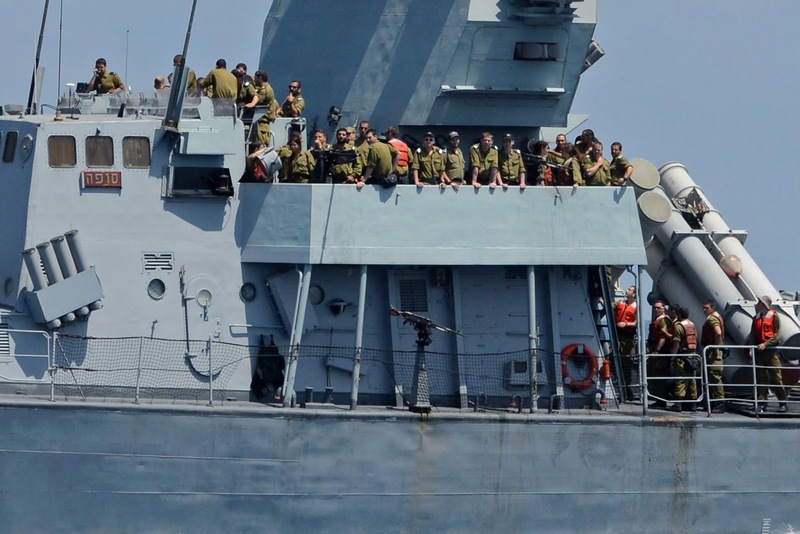 Watch here a video from live fire exercises where Sa'ar 4.5 and Sa'ar 5 launch Barak 1. Except the armament and the electronic countermeasures suites which will be described later, each boat is protected by an impressive amount and variety of sophisticated decoys which are launched from three Rafel-built different types of decoy launchers! 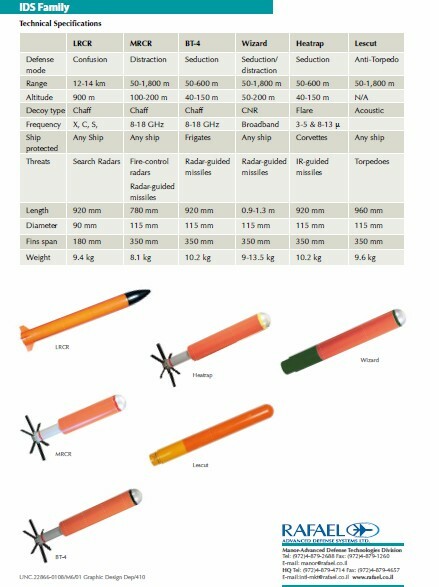 More analytically, the decoy launchers are the five 12-tube (one is twin 12-tube) 115mm launcher tubes for a variety of short and medium range decoys, the two 4-tube 90mm Long Range Chaff Rocket (LRCR) launchers and the massive trainable Deseaver decoy launcher that consists of twelve 6-tube (72 round launcher) 115mm launchers (140 decoys in total of eight different launchers!). For sure these boats are some of the best protected in the world. Rafael’s IDS (Integrated Decoy System) provides the automatic response, optimized for specific scenario conditions. The advanced decoys are programmed in real-time at launch for the best deployment range. System synergy is achieved by rotatable launchers that make optimal decoy placement possible. The IDS design concept enables quick reaction time by turning launchers towards the threat and rapidly launching the decoys. 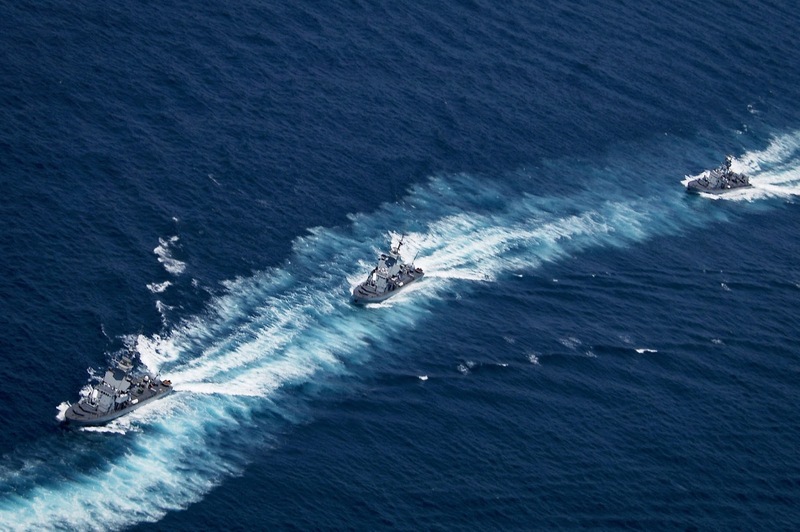 The IDS design concept also facilitates operational flexibility, which eliminates the need for ship maneuvers, effective ship defense that capitalizes on precise decoy location and optimized defense which uses sophisticated decoy patterns to defeat modern threats. The Integrated Decoy and Launch Controller launches expendable decoys to provide automatic, optimal responses to threats according to conditions of engagement. Available modes of operation include: automatic, semiautomatic, manual, emergency and maintenance. The man-machine interface consists of one or two operator control units, either a standard console in the CIC / on the bridge or a standalone display. The following descriptions of the decoys are retrieved from the company's brochures. that are launched from 3 different decoy launchers (2 in the photo)! The Long Range Chaff Rocket (LRCR) is a long range tactical confusion rocket used as a first line of defense against missile attack. This decoy is launched from the 90mm LRCR launchers. The rocket creates a ship-size decoy target at a range of 14 kilometers from the ship. 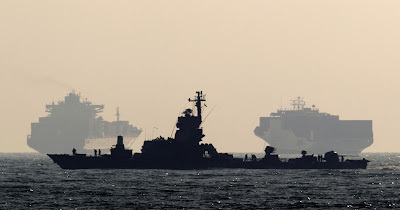 The decoys create a large “protected zone” around the ship that deceives state-of-the-art search radars while the ship is still below radar horizon. 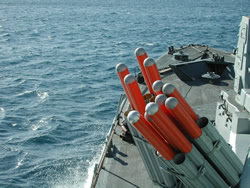 the LRCR is deployed as a stand-alone high-performance decoy. LRCR decoys create optimal engagement conditions. They appear as legitimate, ship-size targets that mislead the enemy as to the ship’s actual location. The MRCR is a Medium-Range Chaff Rocket deployed at ranges up to 1,800 meters, before the missile has achieved radar lock-on on the ship. This decoy is launched from the 115mm launchers. MRCR decoys generate large chaff targets which are detected by enemy missile seekers as a legitimate target. 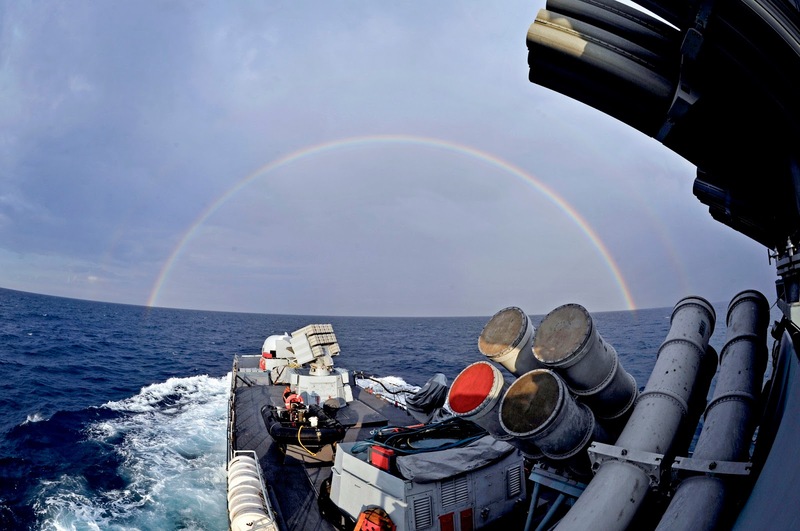 During search, the enemy missile will detect the large chaff clouds, lock on the decoys and fly away from the targeted ship. Based on decades of operational experience, the MRCR is deployed as a free-flight, fin-stabilized, solid propellant rocket that creates a high-performance, lightweight chaff decoy. For operational flexibility and optimized defense, the decoy uses a programmable electronic timer set for the optimum dispersal range at the moment of launch. Before an enemy missile has detected your ship, the chaff target created by the MRCR is more "visible" and causes the incoming missile to lock on the false targets and fly away without attacking the ship. MRCR decoys are especially useful against missile salvos. 12-tube Medium-Range Chaff Rocket (MRCR) launcher at the front of the bridge. Behind, there is a 4-tube Long Range Chaff Rocket (LRCR) launcher. 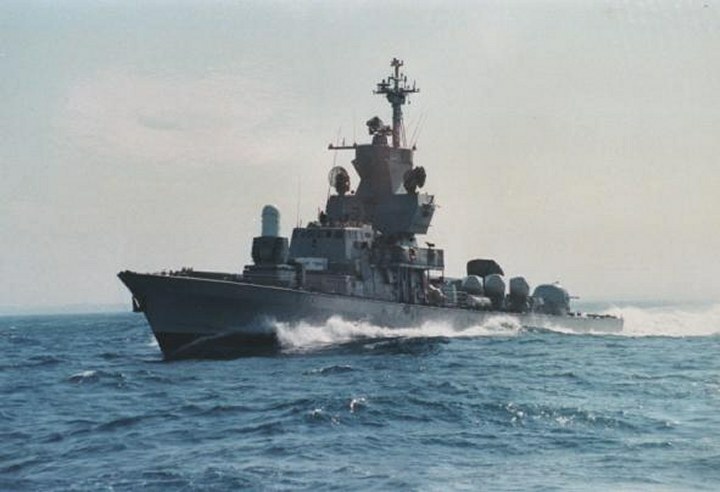 The BT-4 short range chaff decoy provides seduction mode defense to protect the ship against active missiles that have achieved radar lock-on on the ship. BT-4 chaff decoys use rapid blooming chaff which, when deployed at optimum locations, create huge "targets" almost instantaneously that attract the missile seeker and deflect it away from the ship. The generated targets are huge; many thousands of square meters in size. BT-4 is deployed as a free-flight, fin-stabilized, solid propellant rocket which turns into a high-performance, lightweight decoy with a short reaction time and large RCS. For operational flexibility and optimized defense the decoy uses a programmable electronic timer set for the optimum dispersal range at the moment of launch. After an enemy missile has achieved radar lock-on, the chaff target created by the BT-4 causes the incoming missile to “switch lock” away from the ship to the decoys. The BT-4 decoys can defend against several simultaneous incoming missiles. Although most anti-ship missiles are radar-guided, a significant number of threats have infrared seekers or use an IR detector to discriminate against false chaff targets. 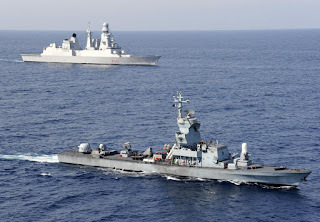 An IR decoy is therefore a vital asset in the ship-defense arsenal. If an incoming missile has an infrared guidance system, the IR decoys confuse the missile's seeker, so that it misses its target. If the missile has RF guidance, with an IR seeker to detect false targets, the HEATRAP decoy provides heat sources to make the chaff targets generated by the RF decoys (BT-4 or MRCR) more realistic and effective against dual-seeker missiles. 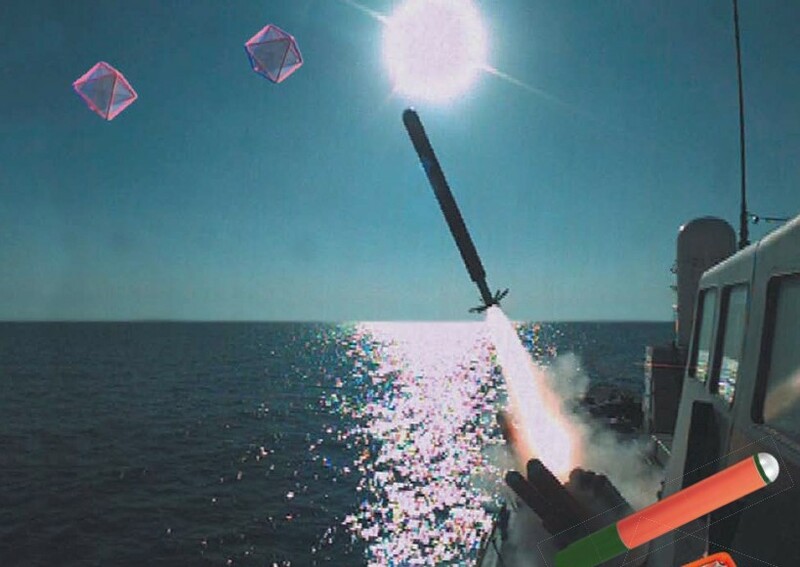 HEATRAP is launched as a free-flight, fin-stabilized solid-propellant rocket and evolves into a high performance IR decoy that operates either stand-alone against IR-guided threats or enhances chaff to generate realistic targets against dual-mode missiles. The payload consists of specially designed twin parachute flares, optimized for high IR radiation in the low and high infrared spectrum. The programmable electronic timer is set for optimum dispersal range at the moment of launch. 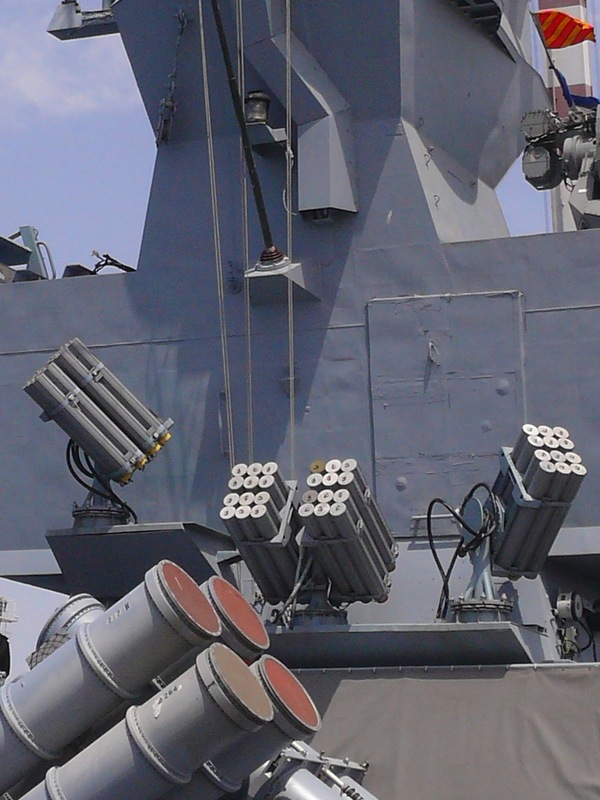 Modern radar-guided missiles are a major threat to surface combatants. They are highly destructive and are capable of ignoring chaff decoys. Defeating these threats requires a quick response, adaptable decoy such as the WIZARD. 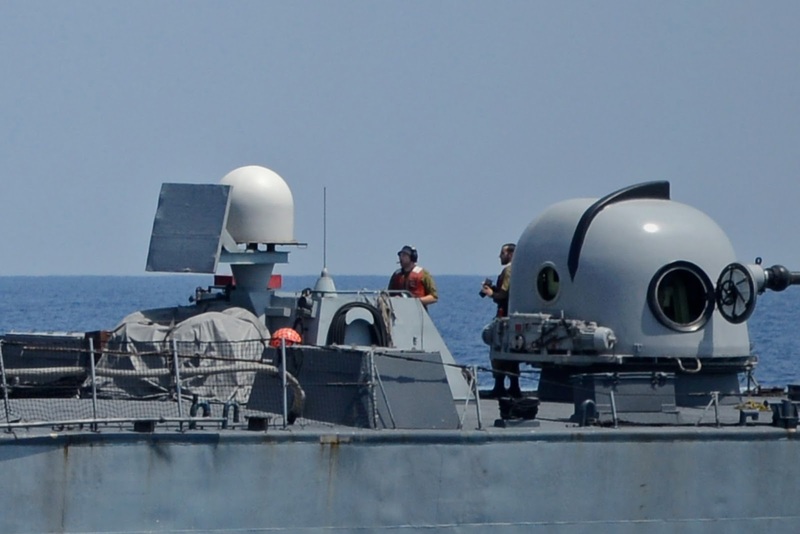 The latest addition to Rafael's complete ship defense suite, the WIZARD distracts or seduces radar guided anti-ship missiles with chaff discrimination capabilities. The WIZARD is deployed as a free-flight, fin-stabilized, solid propellant rocket that opens out into a corner deflector. The return signal from a corner reflector has the same characteristics as a real target including scintillation and glint, since it is generated by a combination of reflecting surfaces, just as a real target. The WIZARD is compact compared to diffuse chaff clouds, which create a large opaque zone and create "self clutter". The WIZARD also prevents potentially dangerous situations in long encounters when lingering chaff clouds, not tracked by the ship’s systems, might serve as a “beacon” for a new threat. WIZARD is a high-performance, lightweight decoy. For operational flexibility and optimized defense the decoy uses a programmable electronic timer set for the optimum dispersal range at the moment of launch. The WIZARD is available in either single or twin corner deflector configurations. Modern acoustic torpedoes are a major threat to surface combatants. They have very advanced features and are highly destructive. 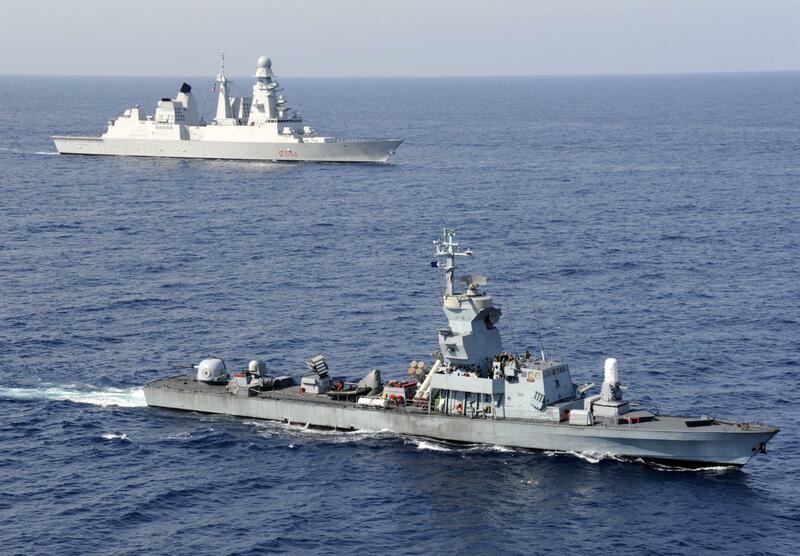 Defeating these threats requires a quick response, intelligent and adaptable decoy such as the Rafael LESCUT. The LESCUT is a clever decoy that requires no pre-launch input/tests, which both shortens the response time and eliminates errors due to incorrect settings or operator mistakes. The LESCUT identifies the incoming threat and provides a tailored response, programmed to defeat all types of modern torpedo logic (i.e. range gates, Doppler shift, pulse discrimination, AGC/DVG, etc.). Whether the torpedo is active or passive, the LESCUT will be a legitimate target for it. Decoy operation starts automatically after launch, with the LESCUT submerging to its operating depth. The LESCUT analyzes the environment to determine whether the torpedo is active or passive and selects the appropriate deception signal for emission. Consequently, acoustic torpedoes will always prefer LESCUT as a legitimate target for homing in on; attacking it repeatedly and enabling the ship to evade the torpedo. 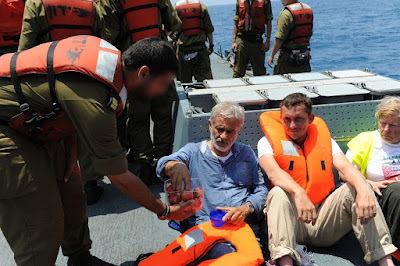 LESCUT will operate for 10 minutes at a constant depth and then self-destructs and sinks. 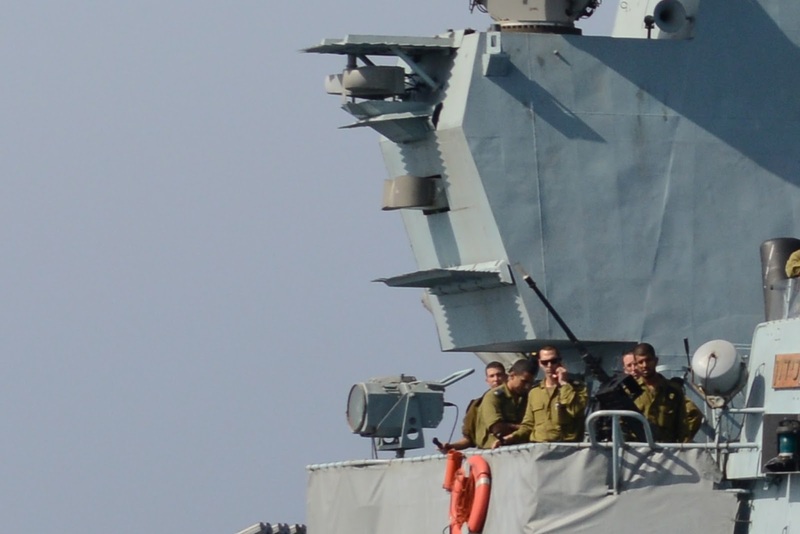 The guidance of Barak 1 SAM is performed by the IAI ELM-2221 Search, Track and Guidance/Gunnery Radar (STGR). Originally the boats in the class were carrying such systems but the one of the two systems was removed. The boats carry it at starboard or port-side and depending on the position of which the system is installed, they operate accordingly in formation. 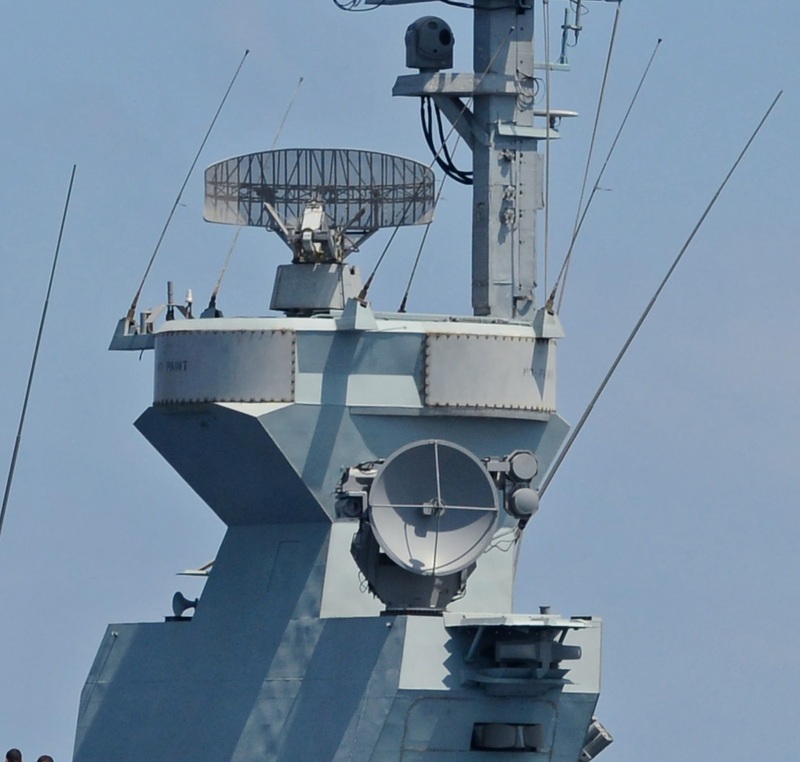 According to the company, whenever the hard kill of sea skimmers calls for uncompromising accuracy under adverse multipath, ECM and/or bad weather conditions, STGR is the ultimate Fire Control Radar to accomplish the task. The STGR is an extremely accurate, monopulse, dual-band (X & Ka) Pulse Doppler radar capable of tracking highly maneuverable targets after fast automatic acquisition, guiding missiles in single or salvo firing and directing guns against air and surface targets, with high anti-clutter and ECCM capabilities. 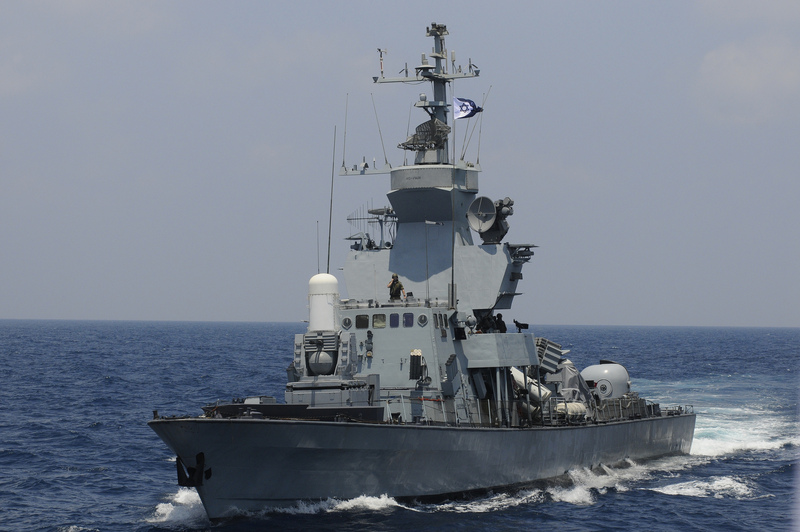 ELTA (subsidiary of IAI) developed the STGR as part of the Barak 1 Point Defense Missile System for Israeli Navy missile boats. The typical performance of the system is missile acquisition at 15km, fighter aircraft acquisition at 30km, effective SAM missile guidance up to 10km, effective surface gunnery up to 20km (gun dependent) and effective air gunnery up to 4 Km (gun dependent). 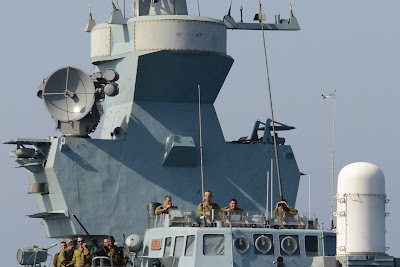 The air and surface search radar is an Israeli development of the Thales Neptune TH-D 1040 S-band multi-function radar, the Elbit (Elta) EL/M-2208 and certainly not the 2218 or the 2228 AMDR (that both equip the Sa'ar 5 instead) as it is reported on many sources. The system is capable of long-range air surveillance and surface (sea) search, and has the ability to quickly detect anti-ship missile at the same time; in addition, can support ship artillery fire control and anti-aircraft missiles. 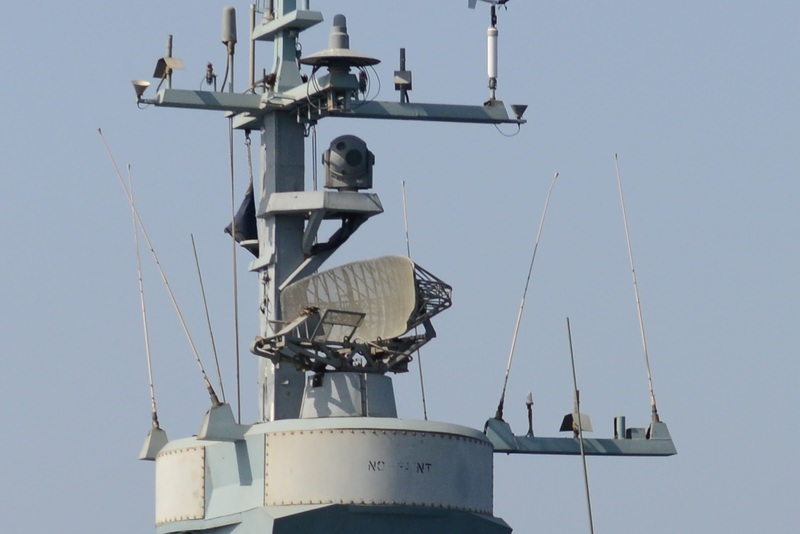 About five years ago, some online sources (source example) were claiming that the boats were about to receive the new EL/M 2258 Advanced Lightweight Phased Array Naval Radar (ALPHA). Just recently, in May 2017, the first of the boats in the class received the ALPHA system. Israeli Navy will proceed the installation of the radar on two more vessels this year. 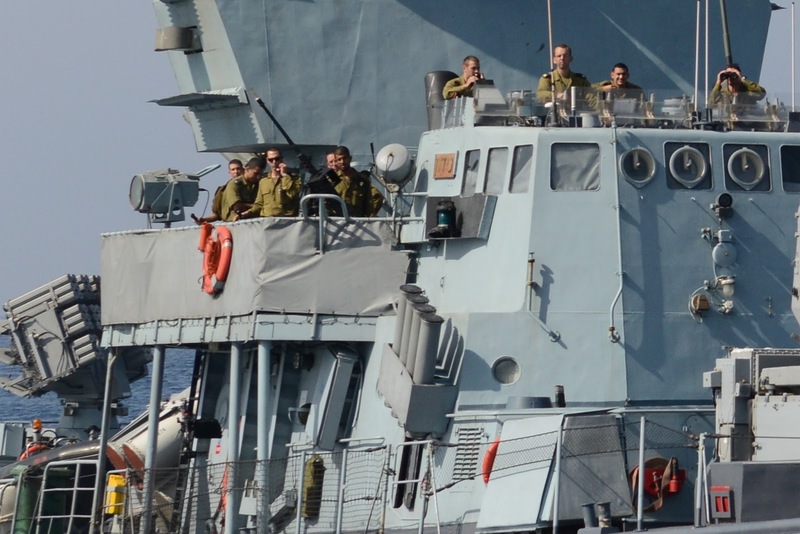 Each boat is equipped with an Elbit (Elop subsidiary) Multi-Sensor Integrated System (MSIS) electro-optical observation, target acquisition, weapon aiming, fire control and surveillance system. The system has been upgraded in the previous decade with a new third generation thermal imaging Forward Looking InfraRed (FLIR) camera. The new FLIR enables MSIS operators to receive high quality and long range video images under difficult weather conditions. System electronics were also upgraded. The new generation MSIS is comprised of a daytime TV camera, in addition to the third generation FLIR, and a rapid laser rangefinder. The system features flexible compact sensor packaging, high performance stabilization and high sensitivity and resolution. And now the most feared part: the electronic countermeasures! Seriously, there is such a mess-up about the electronic equipment on the online sources that I almost did not take anything into account. The thing I did is to examine carefully Rafael's and Elbit's product brochures and also to look carefully high resolution photos from different angles in order to identify systems but also to understand (or guess sometimes) their use. One of the systems I could not identify though, is the following one in the photo, which equips both Sa'ar 4.5 and Sa'ar 5 classes. I might guess that its objective is electronic support measures (ESM) and it is housed in an enclosed mast to avoid the wind erosion and seawater as well as to reduce the whole ships radar cross section(RCS). The electronic countermeasure (ECM) system that is capable of jamming and deceiving threats simultaneously in different directions, is the Rafael Digital SHARK. 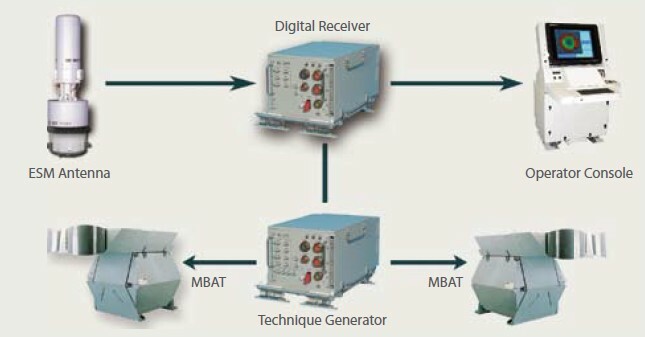 The system is comprised of a modern digital receiver, sophisticated DRFM based technique generators and trackers and integrated Multi-Beam Array Transmitter (MBAT). Employing the MBAT for simultaneous coincidence jamming, high transmitting power and fast beam switching, Digital SHARK sets new standards in naval ECM. 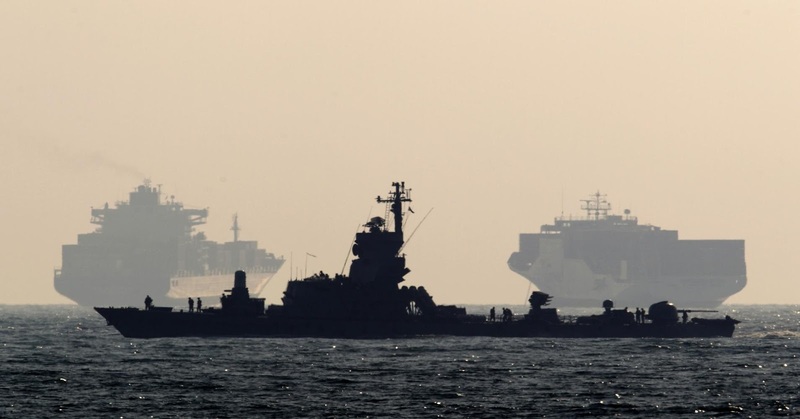 This system enables the ship’s EW suite to support appropriate defensive response against all types of airborne radars, surface radars and missile seekers. Two MBATs covering 360º in azimuth, enable immediate positioning of a transmitting beam with very high effective radiated power (ERP). The Shark easily interfaces with Rafael’s C-Pearl electronic support measures (ESM) and other on-board combat and data systems. The C-Pearl-DV ESM is integrated with Digital Shark ECM system for a complete EW Suite which I might guess here, it is called SEWS-DV, a suite designed for both ESM and ECM applications. It enables automatic detection, data measurement and identification of threats. A single small antenna array handles both instantaneous frequency measurement and instantaneous direction finding with common multiple channel digital receivers. This unprecedented combination yields very high probability of intercept at full dynamic range and frequency coverage with excellent frequency filtering. Using a high performance digital receiver, the ESM system is immune to interfering signals. 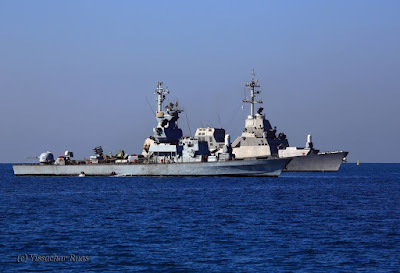 The boats have been spotted in the past with an antenna atop of their mast similar to the one that equips Sa'ar 5 class corvettes and similar to other European frigates such as the Thales Altesse. 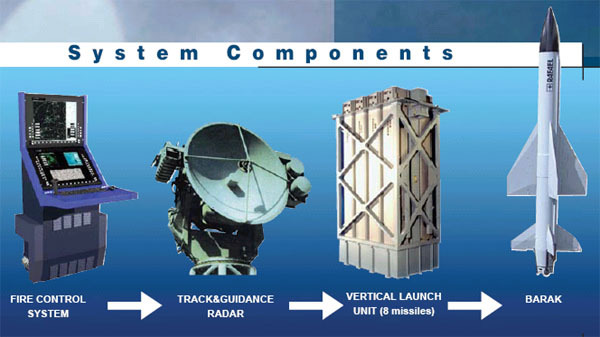 This is a variant of Elbit's NATACS Communications Intelligence (COMINT) / Direction Finding (DF) systems. The NATACS System is capable of coping with advanced agile frequency communication radios. 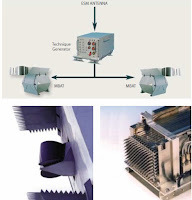 This fully integrated system - equipped with ultra-fast, Wide Band Receivers and Direction Finding (DF) Systems has outstanding scanning rates enabling the handling of extremely dense electromagnetic environments in the HF/VHF/UHF/HUHF frequency bands thanks to its Active or Passive receiving antennas connected through RF distribution units, characterized by frequency hopping, burst, and other agile transmissions. Among its main features is the Automatic Direction Finding and "FIX" signal classification and identification capability, focus on signals of interest by activating various filters and criteria (azimuth sector, signal type, etc. ), monitor signals of interest (content & traffic), high-level analysis of suspected signals and signals of interest and high-capacity Digital Audio & IF Wideband Recording. In their regular load, the boats do not carry this antenna. 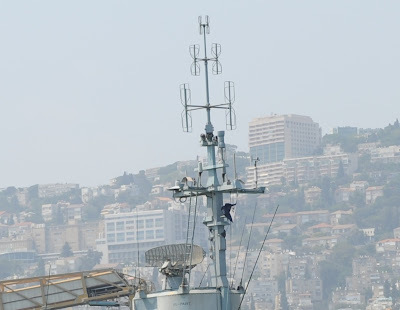 Another system, that quips the boats in the class, which though I am not 100% sure if truly this is it, it is a system by Elbit's (Elisra subsidiary) NS 9000 family of ESM and ECM system. Most reliable sources report the NS-9003A ESM and NS-9005 ECM suite where the ECM fully co-exists with the ESM and both maintain maximum operational functionality with no mutual interference. Utilizing sophisticated power management techniques, Elisra's solutions minimize or entirely eliminate the need for time sharing between the ESM's signal reception and the ECM's jamming and deception systems. The NS-9005PR noise and deception jammer uses two non-stabilized multibeam array transmitters (MBATs) based on the RAN-1010 MBAT, each covering 180°. Each boat carries one or two inflatable boats at the stern as well as one rigid-hulled inflatable boat (RHIB) that is launched and recovered by a crane located amidships. 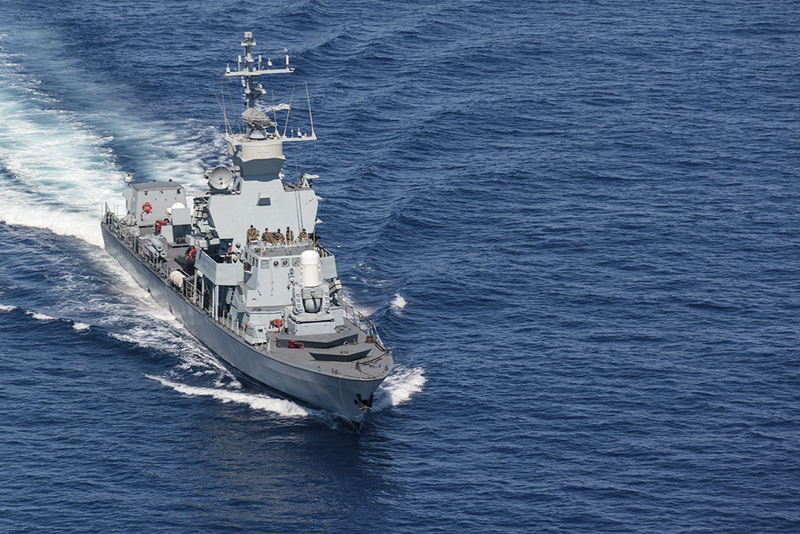 The boat's combat management system (CMS) is built by IAI and integrates all sensors, communications and weapons systems for synchronized performance of the combat system and ship. CMS provides a Common Tactical Picture and Threat Evaluation to support all levels of decision making processes and control resource allocation for engagements. 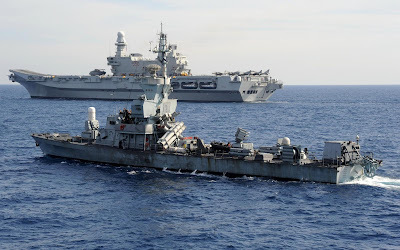 The CMS assures effective utilization of the advantages of each system on the ship and optimal usage of their capabilities according to the situation. The basic traditional OODA (Observe, Orient, Decide, Act) loop model is applied to all major activities. The CMS interfaces with the major ship systems via a high performance LAN. Using fast Ethernet interfaces, the CMS provides a standard system interconnection scheme. Dedicated Bus Interface Units (BIU) support any other systems with special electrical interfaces. 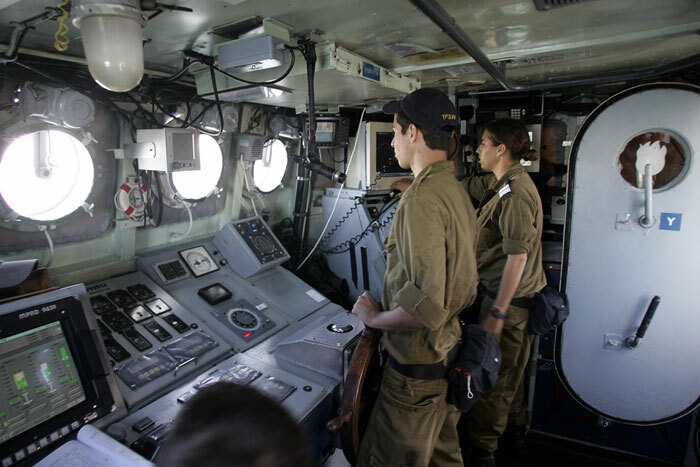 The combat room consists of Multi-Function Consoles (MFC). Thank you, I corrected the text. Maybe, this news might be useful to you. 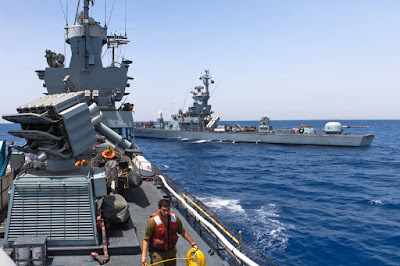 The Defence Security Cooperation Agency (DSCA) has just made known:"a possible Foreign Military Sale to Israel for 13 76mm Naval Gun and Technical Support". 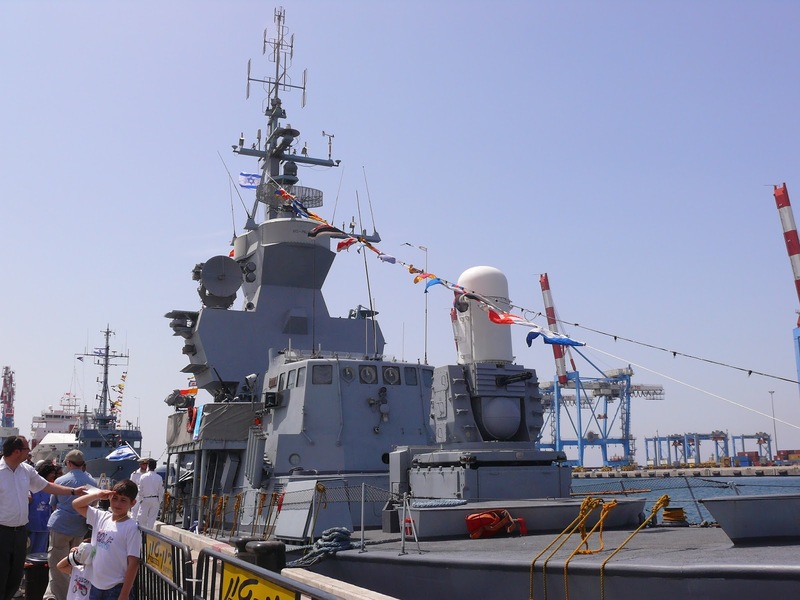 "The naval guns will be installed on Israeli Navy SA’AR 4.5 and SA’AR 6 Missile Patrol Boats." The type of 76 mm choosen was not specified but, in my opinion, the most probable option is that it coul be the "Super Rapid" version. Thank you! Yes, I mentioned that in my article "In August 2016, the Israeli Navy was in contract negotiations with the US Navy to purchase 76mm rapid-fire guns from Leonardo-Finmeccanica. 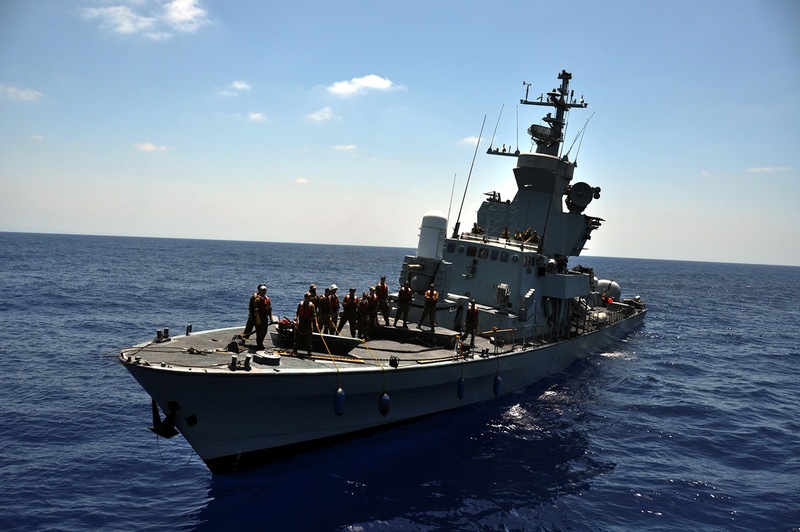 Israeli Navy officers said the new guns would equip Israel’s surface fleet of Sa’ar-4.5 vessels, US-built Sa’ar-5 corvettes and the four new Sa’ar-6 corvettes which are under construction at the German shipyard ThyssenKrupp Marine Systems and of which the first is expected to enter service in 2019.". So if we talk about 13 systems, then we have 3 x Sa'ar 5, 6? (and not all 8) Sa'ar 4.5 and 4 x Sa'ar 6 that will receive the guns. But if they mention only Sa'ar 4.5 and Sa'ar 6, then one gun system will not be used. 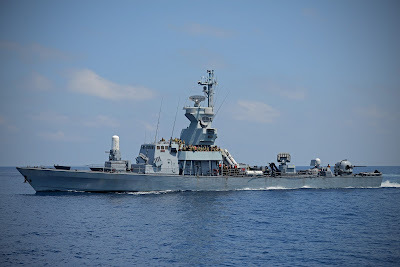 The press release coming from DSCA says that the possible sale of 13 guns will be for Sa'ar 4.5 (so, all 8 ships will be equipped with new guns), Sa'ar 6 (4 ships) and the last one will be located at an Israeli Naval Training Center, to be used for training maintenance personnel. There's no indication for Sa'ar 5. That make sense then! Thank you for that information, I will include that in the article now that I have more details. it's a pleasure for me! Great article, thanks for putting the time in to do the research. Thank you Nate, I am glad you enjoyed it! Finally a photo of it! They have announced that long time ago, I thought it will never take place the upgrade. Excellent news, thank you! I have to say great work and analysis. I hope to see soon a great analytical article like this one for the Saa'r 5 . Thank you! Of course you will see, it is in my plans for sure. 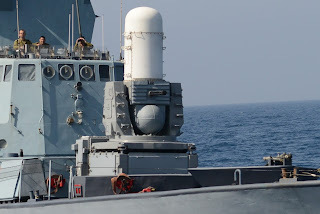 Recent photos show Phalanx CIWS removed from Saar 4.5 and also Saar 5 vessels. Any theories on the reason?